The Royal Canadian Mint has included a new security enhancement on the 2015 Gold Maple Leaf bullion coin. In addition to a previously introduced micro-engraved laser mark, the coins now also feature a complex radial line finish. Over the past two years, the Royal Canadian Mint has been adding new security features to its popular Gold Maple Leaf and Silver Maple Leaf bullion coins. 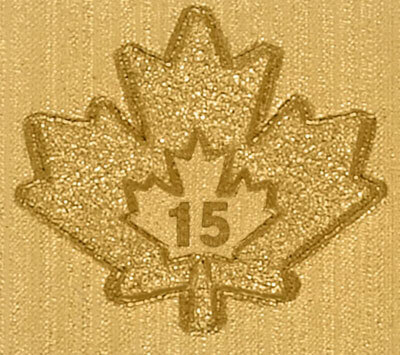 In 2013, an intricately micro-engraved mark produced with laser technology was added to the reverse of the Gold Maple Leaf. It consisted of a textured maple leaf with a two digit number present in the center corresponding with the last two digits of the date of the coin. The following year in 2014, a similar micro-engraved laser mark was added to the reverse of the Silver Maple Leaf. A new finish was also introduced which consisted of radial lines which emanate from the center of the coin and extend outwards. The lines were precisely machined with a specific width and pitch to create a light refracting pattern. 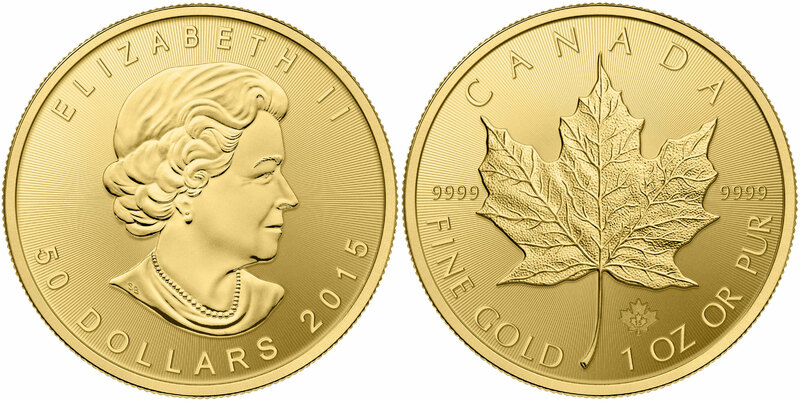 A similar finish has now been adopted for the 2015 Gold Maple Leaf bullion coins. According to the Royal Canadian Mint, the combination of the micro-engraved laser mark and complex radial finish will place the coins at the forefront of gold bullion security. The 2015 Gold Maple Leaf bullion coins have already begun distribution through the Mint’s network of official bullion distributors. In keeping with the distribution model common to many of the world’s major bullion issues, the Mint does not sell bullion directly to the public. Why all the security enhancements? I haven’t read or heard of any counterfeit Maple Leafs problems . . . but then I could have missed them. I’m sure the Chinese are doing everything they can to counterfeit anything of value including the gold Maple Leafs. It’s who they are. I applaud the Canadian Mint for trying to stay ahead.